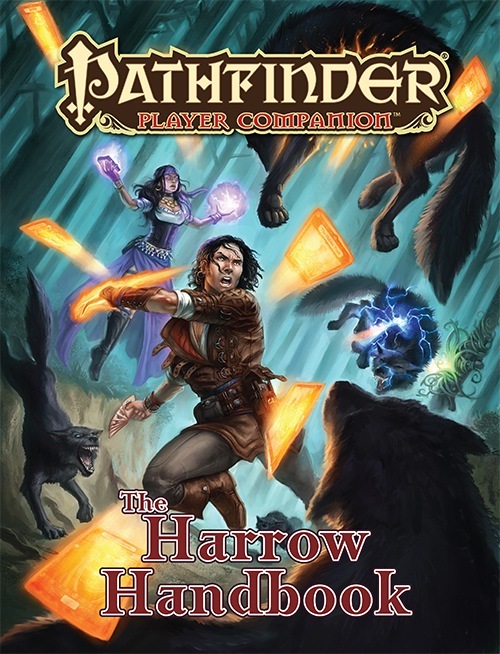 New archetypes, building types, equipment, feats, spells, and traits to help you incorporate the mystic secrets of the harrow into your characters and campaigns. Rules for games that use the harrow cards and are played everywhere from upper-class card parlors in Cheliax to underground gambling dens in Absalom. If you like the harrow or even own a Harrow deck this is a must have. Some of these stories are in this book. One card for each suit. I wish I could have more and I'm hoping there will be more slipped into future books and lore related to the harrow. Maybe even more hints on the "lost suit" (mentioned in this book) in the future. In short, ifyou like the Harrow, in whole or in part, and you want to add it to your game and/or your character then you want this book. Every class, any random background. Especially if the deck is a prop in your game (as dice or cards). There is a picture of every card on the inside cover, especially helpful for those not getting the deck itself. This book is without a doubt one of my absolute favorite books from Paizo. When I got it, I tore through it, as I love the Harrow concept and couldn't wait to read this book, cover to cover. Not only are there a lot of really cool mechanical options, but the 6 "chapters" focused on each of the symbols in a Harrow deck are awesome. Each one gives a really nice description of what a person who feels a connection or is guided by a particular suit might be like, giving lots of ideas for great role-playing moments. Its an fantastic book, and if I could give it more than 5 stars, I totally would!! The Harrow Handbook is the perfect example of how to mix “crunch” with “fluff”. Apart from the brief aberration that is the order of the hammer and a few combat feats, every option in the book has story value as well as mechanical value. This book adds life to the campaign setting in a way many other Player Companion books fail to, by developing something that is uniquely Golarion. This book is overflowing with flavour and I absolutely love it as a result. It is, without doubt, one of the best books in the entire Player Companion line and will be seeing a lot of use in my campaigns. Quality merchandise! Lots and lots and LOTS of options. I love it. Announced! Product image is a mockup and subject to change. So this might be the Year of the Demon, but May is the Month of the Harrower, hm? I foresee this getting a lot of attention in our Carrion Crown game. Looks like I'm waiting until May to run The Harrowing. Of course you realize that by my getting this through my subscriptions, I'll likely have to get the new deluxe card set. Hmm... Kind of on the fence with this one. It could be really cool if done right. I'll buy it regardless, but I'll wait to pass judgement after I have given it a thorough read. I actually have a PC in the works that is all about the Harrow Deck, and plans on becoming a Harrower. This book is going to be AWESOME for him. Rather pleased, indeed, I am. Why the interest in Harrow all of a sudden? There is an old Dragon article from the "astrological" and portents issue telling how to use Three Dragon Ante deck in character gen, including making stats. I loved this article. More like this, please. It would be really awesome if there was an archetype for the Sorc, Wiz, or maybe Witch, though I would really, really love it if there was a Sorc archetype. This is something I have been waiting for every since the old Ravenloft deck came out. Huge task to pull of well but I have faith and how cool would it be if you do. I was always a fan of the flavor of the Harrower prestige class, but rarely find myself in games that go to a high enough level to really get very far into it, so some sort of archetypes would be something i'd love to see as well. Updated product image and description! So this is a much updated version of the Pathfinder Chronicles Harrow Divination Book? "A guide to the lost harrow cards that sometimes appear unexpectedly in harrow decks..."
Sounds interesting. I wonder if there is any sort of alternative "card magic" aside from divinations and such in this? Something along the lines of using cards as an alternative scroll or the like. Maybe this book will have some more things to go along with Deadly Dealer. Have you looked at the cover...? Yeah, the guy that Dragon78 is talking about on the cover is clearly using the Deadly Dealer feat. New building types? Like Kingdom Building? Nifty. Is the "Harrow character building" bit based on your rules system, Liz? What bums me out about this product is the relentlessly anti-harrow stance that PFS has taken throughout its existence. Since that's basically all of my tabletop gaming these days, that makes me kinda sad (PbP is not the right medium for harrow stuff at all). This. I wouldn't be surprised if nothing in this book is pfs legal. I am curious why has the PFS banned everything connected to the Harrow? My understanding is that it is easier to cheat with cards then with dice, and additionally I believe it might have something to do with certain real world religious views towards tarot. Gary and Christopher are doing some repair work in the code that generates shipping labels. There may be a few customers that see shipping notices this afternoon as they do final testing to make sure things work. If you see a shipping email, your packages won't leave until Monday at the very earliest. Because 99.9% of subscribers will not start to see shipping notices until next week, I would ask that anyone who does, be considerate and discreet about the contents/spoilers from the books if you choose to look at your PDFs (for subscribers who get free PDFs when their book ships), until next week when the bulk of subscriptions will be shipped. So this is a really good book. I love the player options and if you combine a card caster and a staff magus on a magus you totally have gambit. What are the archetypes man?! Spill for those of us that have to wait! Meeps quietly into a corner. Yeah my girlfriend will get a kick out of that if it is half as cool as it sounds. Care to elaborate on the witch, cavalier order, and the story summoner? Nothing wrong with that. I don't think Pathfinder source books should need to be written with PFS legality in mind. Unless, of course, the book is directly concerned with the Pathfinder Society. I'm betting most of the people who play Pathfinder don't care about the PFS, and the game should not be restricted for these players just for the sake of PFS legality. 1.Card Caster, and does it stack with the staff Magus archetype? 2.Harrowed bloodline, spill the beans what does it do? 4.Cartomancer, what type of abilities does it give?